Late post: Last Summer (around April), Tina of http://trulyrichmom.com/ sent me a private message if I wanted to include Meg in the July issue of Mustard magazine. (She was so kind to inform me since I sent her a message about their June issue, but all slots are full for that month.) Meg just had to answer a question for the July issue. The question was, "What do you like doing more than playing with gadgets? Why?" A high-resolution photo is also needed and because I don't have recent high-resolution photos of Meg (most are phone captures only! ), we went to a studio for a simple photo-op. Medyo hindi photogenic si Meg hehe... And here's the section of the Mustard magazine, I had to cut it since there are 5 kids included in the section (don't want to publish other kids' info). Oi ah, si Meg talaga sumagot nyan. 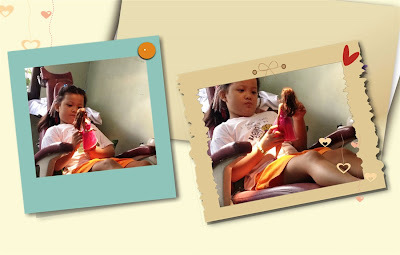 Tsaka yan talaga hilig nya e, pretend play. I recommend the Mustard magazine for kids. I actually read the magazine and madami talagang matutunan, I think it's for kids aged 6-10 years old. Meg read about the importance of limiting the gadget use for kids. 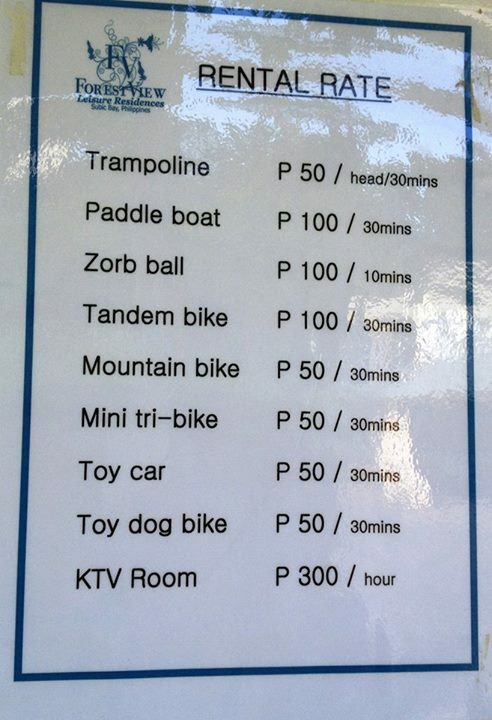 Swak na swak sa mga bata, di'ba? And super mura for P20 each issue. 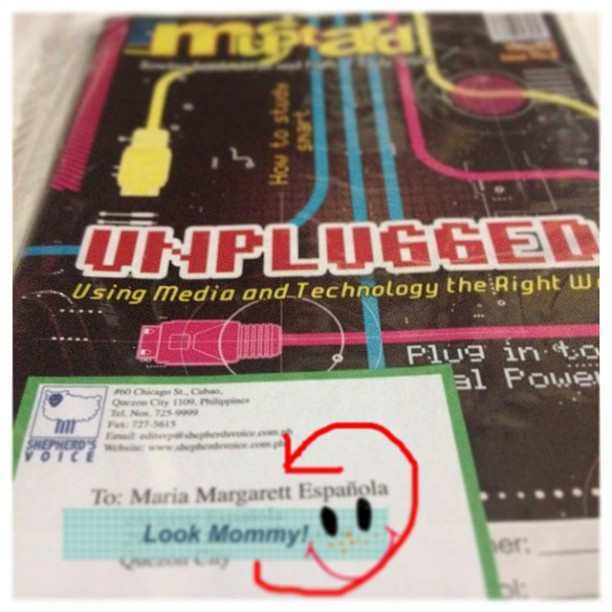 We received our complimentary copy last month and Meg was so happy that she saw her name! May sumusulat na daw sa kanya. hehe... Anyway, mas aligaga yung Mommy since I bought few copies last July. Alam niyo naman pagka-super stagemom ko. Aminin naman natin mga Mommies, kahit na name lang sa Magazine tuwang-tuwa na tayo. Pampa-good vibes din di'ba? She uses glue sticks and so far, we have tried three different brands already. Meg shares her own review for these glue sticks. The first glue stick we tried is the Dong-A, the school recommends this brand. For P21.75 (15g), it's ok but Meg told me the glue stick got stuck at times leaving the opening dirty. She is also having a hard time twisting it up and down. Tsaka ang laki daw. Still, it dries nice. Our second option is the Bic Glue Stick. Works on paper, card and photographs. Bic glue stick (P26-8g) is more expensive than the Dong-A but smaller. It can be easily opened and twisted. It works better than the Dong-A but can leave a residue sometimes.Ok naman to but I saw another brand so try ulit. The third glue stick we tried is the Elmer's Washable School Glue Stick (Disappearing Purple). For 6g, it is priced at P24.75. Meg loves to use this because of its color. As you apply it, the color is purple and slowly disappears as it dries. Aliw si bulinggit! It dries nice and smoothly, too. Meg asked me to buy this brand na lang daw, not the others we tried. The best na 'to for her! So happy Mommy ako when I saw her super neat Assignment notebook with all the pasted reminders. 1. I eat a lot (which is really really BAD). This would mean more chocolates, sodas, and RICE. Haha! 2. I drink coffee. Although I am a self-confessed coffee addict, I double the dose (haha gamot?) if emote levelz ako. 3. I just lay in bed or the sofa all day watching any TV shows. 5. I play games in my phone. 6. I browse my IG, Twitter, Pinterest, and FB account until my eyes are tired. 7. Seriously, when I feel BAD about something or I feel the world is just too hard for me, I READ Inspirational and Motivational quotes. I always promote POSITIVITY and seeing the GOODNESS in every people, but sometimes I just feel so consumed that I can't breathe anymore. And maybe, I just forget, tend to forget always, that I need to PRAY to calm myself and to release everything. I should let go of all the bad vibes and SHARE with you that yes, it's normal to have hard days and experience difficult moments but let's keep in mind that there are some things worth smiling for than frowning and just believe that BETTER THINGS will come (YES it will!) ultimately. Being fresh is something all of us women should be really aware of especially when it comes to feminine hygiene. I'm OC in terms of using tissue, alcohol, and sanitizers when I go out. With the kind of job that I have, I often use public restrooms and you know how uncomfortable it is when you don't have all the comforts (of your home) to wash so a tissue will just do. But that's entirely different with our feminine area; we need to wipe it to keep it dry and clean. Good thing there's pH Care feminine wipes by Unilab. I've been using its counterpart feminine wash for quite some time now and I'm glad that they come up with the wipes that come in handy and is perfect when you're always on the go. It comes in a small pack that fits even a small pouch. Perfect when you're out of the house. It is very important since balanced means "normal". Meaning having a pH-balanced feminine wipes maintains the pH level in our intimate area. Having unbalanced pH level may be uncomfortable, cause irritation and infection if worsen. So pH Care Feminine wipes (being pH-balanced) is safe and gently cleanses our intimate area. Good thing pH Care Feminine Wipes is also Alcohol-free, Hypo-allergenic, and Clinically Tested. It also has two variants: Passionate Bloom (floral scent) and Cool Wind with ActiveCool. Sana lang they also come in bigger packs, like the baby wipes diba? =) Each pack has 10 wipes and cost P40+. So if you want to be clean, feel clean and fresh all day; I recommend you use pH Care Feminine Wipes! 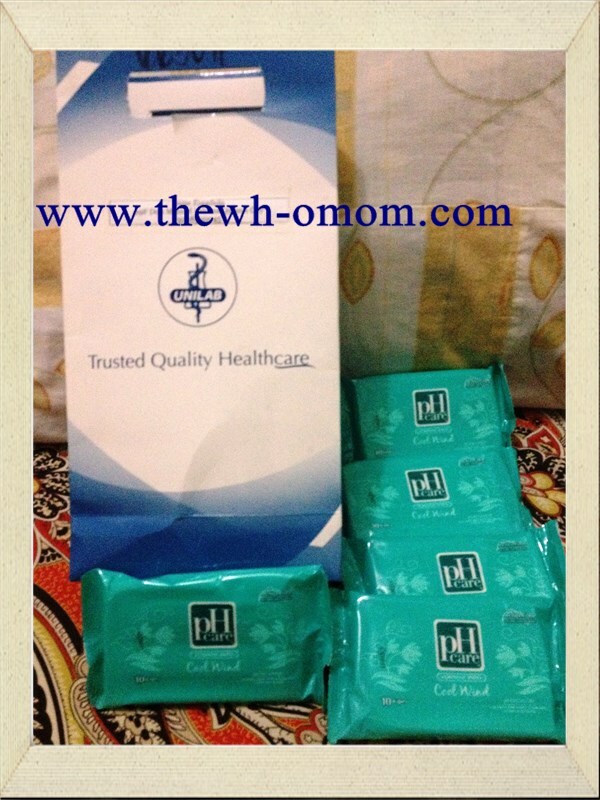 Disclaimer: I have received pH Care Feminine wipes samples from Unilab in exchange of my review. I was not required to give a positive review nor was I compensated in any way. All opinions are mine. Our family loves to dine at Uncle Cheffy. With its cozy ambiance and the not-so-expensive meals that are good for sharing, I can actually say it fits our Personal Taste. What do we usually order? I love that the meat is so tender and the taste is perfect. It can be perfectly paired with Asian Fried rice. I like my steak to be well done. What I like also about Uncle Cheffy is that you have different options for condiments (pictured below). I pair my steak with tomatoes and the green vegetables and it's super sarap! You may also try it with gravy, but they could improve more on the taste of their gravy para bongga! This is one of the tastiest and delicious fried rice I tasted. Bet ko nga gayahin to pero mukhang di ko ma-achieve hehe... Plus, kanin pa lang ok na. This is perfect paired with Memphis Barbecue U.S. Beef Rib Finger (pictured above). 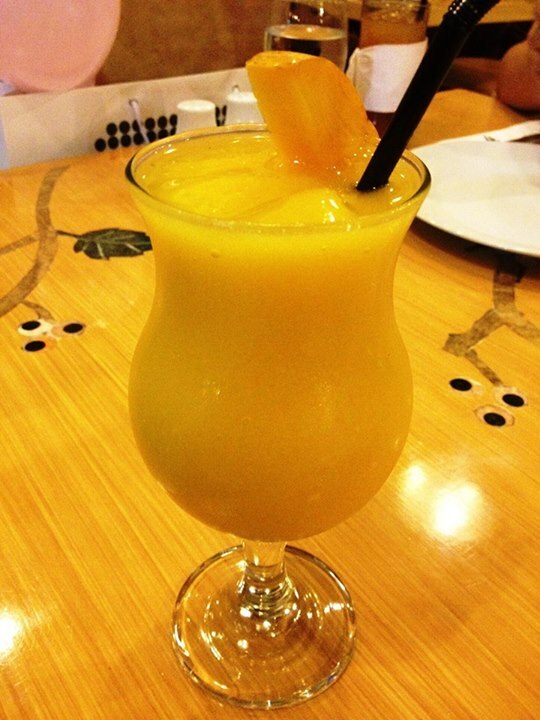 Our super favorite! Roll the Panizza with the Arugula leaves, tomato, and Alfalfa sprout inside, it's super delicious! Why we love Uncle Cheffy? The food choices are really YUMMY. We love the ambiance; it's very cozy and somehow kid-friendly. Orders are for sharing (2-3 persons). 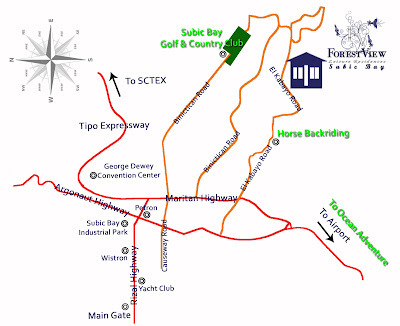 Maintain their facilities especially the Restrooms. More food choices for kids. In a scale of 1 to 10 where 10 is best, I give Uncle Cheffy an 8. Disclaimer: This is not a sponsored post. All opinions are mine and of my family. My opinion/taste may be different from yours. Are you planning a party for your kid/s? Here's one fair you shouldn't miss! I just saw this poster on my Facebook timeline and because I'm sort of planning for Meg's 7th birthday, I'll definitely clear my schedule on August 17, 2013 at the Rockwell Tent. There will be different party suppliers and stylists that can help you achieve your dream party. Raffle, entertainment, and surprises also await you. Ikaw ba ay Batang Superbook? I have few memories of the series. Basta alam ko yung mag transform yung mga bidang kids sa time ni Jesus with a topic/lesson (so parang adventure) then they learn more about the Bible with a fun twist since cartoonize/animated yung show. 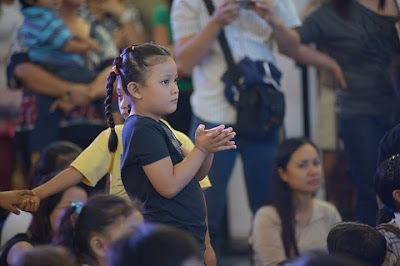 When I got an invite for the Batang Superbook Roadshow, I was thrilled and excited for Meg since this will be the first time I'll introduce it to her. Medyo maaga kasi yung show sa GMA 7, Sat and Sun - 7:30 AM. I don't wake her up early during weekends since no school naman. Good thing there's a Batang Superbook website where kids can register and join. Meg just registered! =) I encourage parents to let your child join. Remember I posted How to Strengthen your Kids' Faith; this is definitely one creative way to make them understand more and grow their relationship with Jesus. There are informative videos and games in the site. 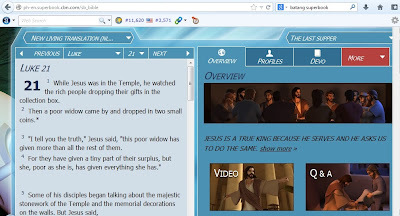 There's also a Bible online where kids can learn more about the different Bible characters, interactive stories, and what's more exciting is the fun interaction with the different Batang Superbook members. Pa-explore ko to kay Meg over the weekend. 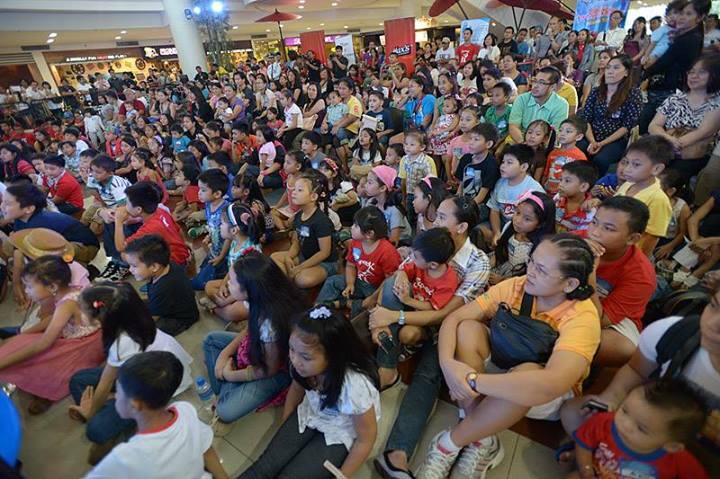 =) Back to the Roadshow, I didn't realize ang daming Batang Superbook! Meg enjoyed the activities and the Magic show, plus the episode "Miracle of Jesus". Pati ako nag-enjoy manood. Ang daming tanong ni Meg after the show about the episode they watched, and I am happy she got the whole idea about it. I saw the kids, they really did enjoy watching it. E diba aminin natin, pag Bible na babasahin ng bata, ayaw na. 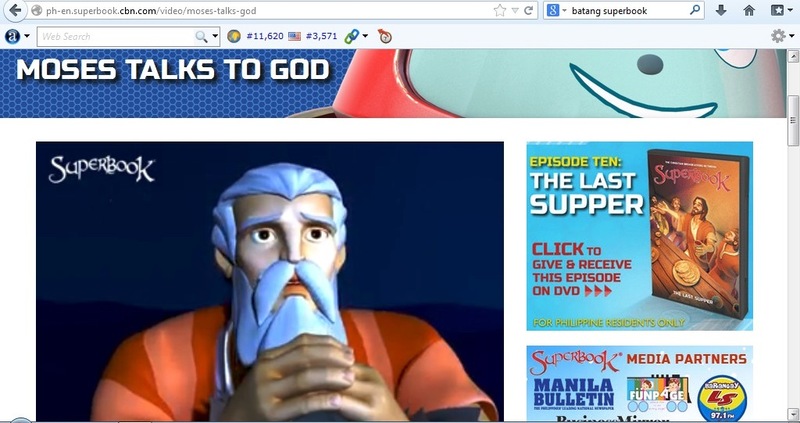 Sobrang OK talaga tong Superbook. Superbook Hits Ratings Charts Again! It only means more and more people are watching the show - children and even parents. 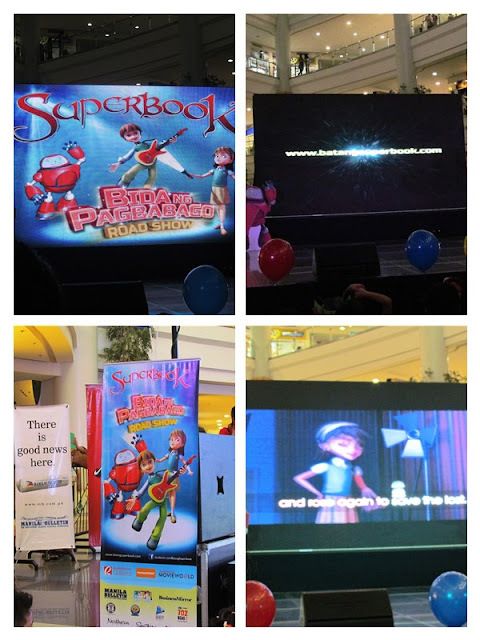 Moreover, Superbook lovers and supporters can now watch Superbook episodes on DVD! By simply giving P500/month to Superbook, viewers will get one copy of the exclusive Superbook episode of their choice each time they give. This is to support Superbook’s airing cost. Plus, you give the children of this generation an opportunity to learn God’s word in a new and exciting way! 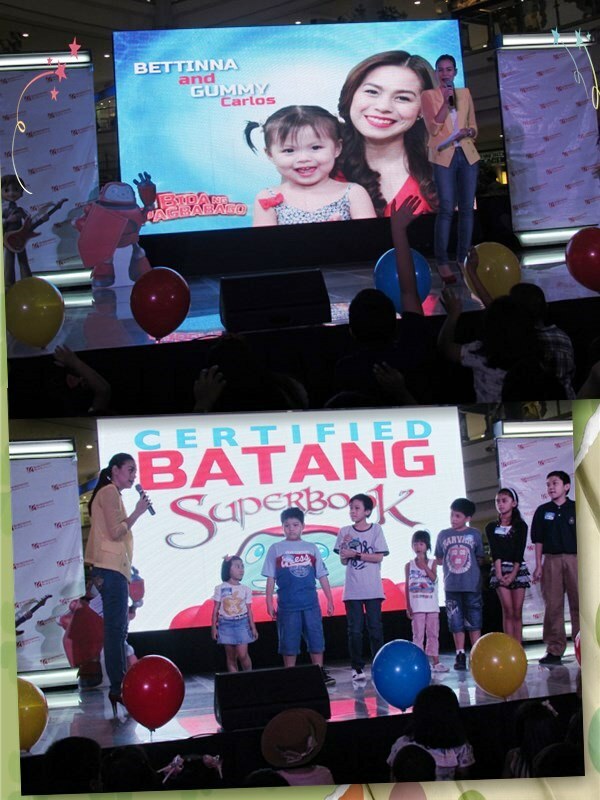 For more information on how to get the complete season one DVD set, visit Batang Superbook website. Meg got the chance to meet Gizmo, too! For more information, games and exciting promos, you can visit the Batang Superbook website. Who doesn't love first times? First walk, first word spoken, first haircut, and any firsts of our children are very special for us. Last Saturday, Meg (my daughter) experienced another first in her life (life talaga? hehe). 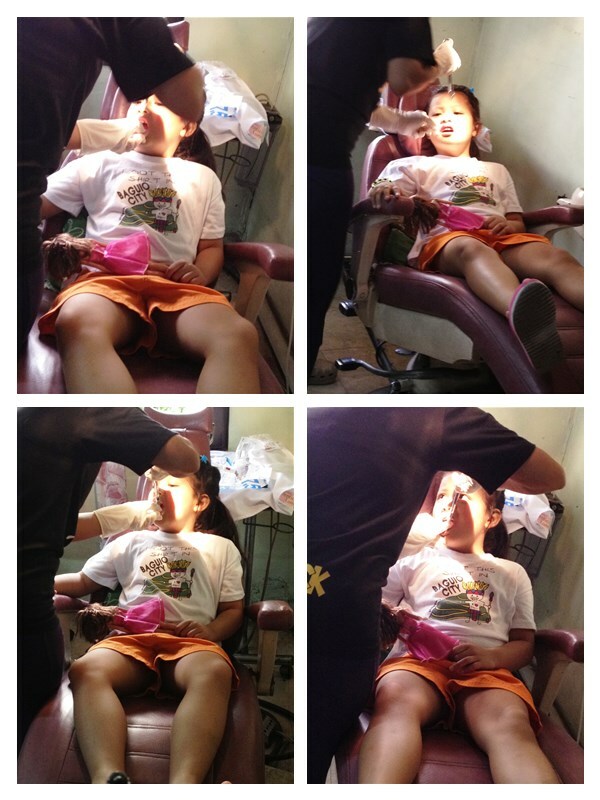 She had her first tooth extraction. 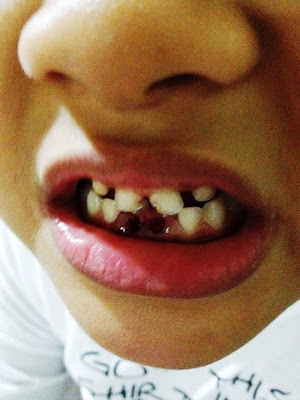 Naaahh it's actually teeth since her dentist advised that she will pull her two bottom teeth. I asked Meg if she's scared or something but she bravely said "No". To be honest, I'm more of the freaking-out Mom again since tooth extraction would involve injection and I am worried if she will feel any pain. 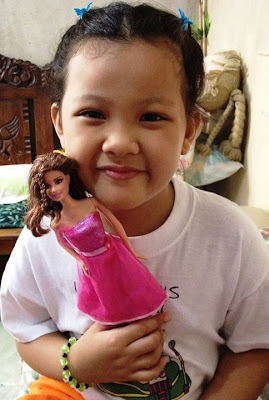 She asked me if she could bring Barbie along so that she would be braver with her around. She was very quiet when we are on our way to the dentist but as soon as we arrived, she seated comfortably on the dentist chair. Tingin mo Barbie, anong gagawin sa akin? Injection na, anxiety attack na si Mommy! I asked Meg if she feels anything but after an hour or so, maybe the anesthesia subsided already, she then told me, "Mommy ang sakit." So wawa naman. Pero ganun talaga e. She had to experience it, plus marami pang susunod. The motivation that also worked for Meg is her excitement that the Tooth Fairy will visit her. She watched the movie Jack Frost so she is very aware that when a tooth was pulled or fell, the Tooth Fairy will visit. So I guess just like Santa Claus during Christmas, the Tooth Fairy will sneak again at the middle of the night. :D She placed it under her pillow and as soon as she opened her eyes in the morning, she hurriedly checked if the Tooth Fairy left something for her. To her dismay, the bag is still there. Ok ok my bad, I fell asleep, too. I felt really guilty so I rushed downstairs and made some magic. Haha! After 10 minutes, I asked her to look under the pillow again. I said, "Maybe the Tooth Fairy was just late." 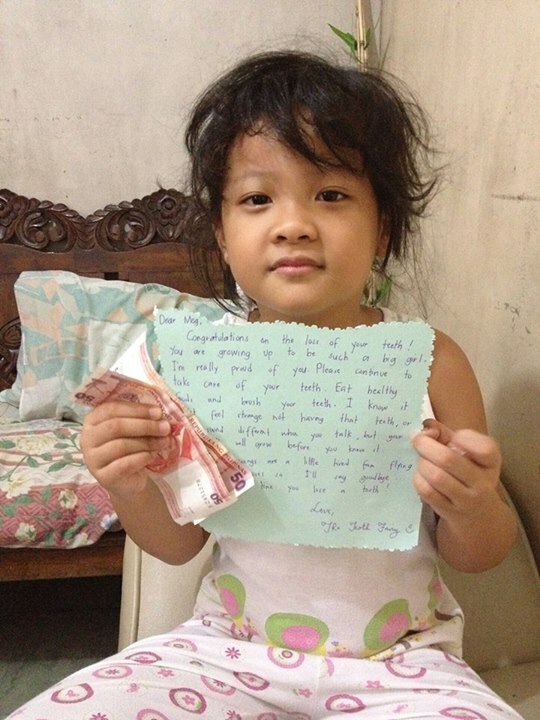 :D And ayun nga, she saw the letter and the money. Grabe Meg was screaming, "Mommy Mommy look! The Tooth Fairy came." She was so happy she was jumping while screaming. And the OA Mom is on the verge of tears. Ang sarap ng feeling. Congratulations on the loss of your teeth! You are growing up to be such a big girl. I'm really proud of you. Please continue to take care of your teeth. Eat healthy food and brush your teeth. I know it just feels strange not having that teeth or may sound different when you talk, but your teeth will grow before you know it. I'm feeling a little tired from flying from house to house so I'll say goodbye. O diba? Haha! So remember, don't just "play Santa" but also "be the Tooth Fairy". I know this is not a big deal for some and maybe, I'll just wait for the time to explain to her about it. But for now, I'll enjoy fun-to-pretend things with Meg and continue to discover magic moments that will make her happy. 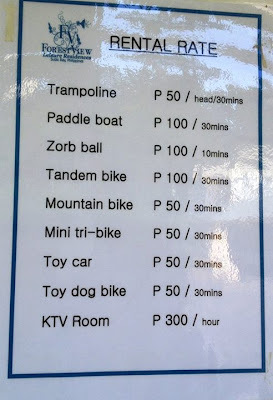 When we went to Subic (see my post about Zoobic Safari) last May, we stayed at Forest View Leisure Residences. Let me go through our experience about our overnight stay at their Deluxe Villa. Since our trip is unplanned and because it's a peak season, the only available villa that time is the Deluxe Villa. The villa has 3 bedrooms, 2 toilets and baths, air-conditioning and water heating system, kitchen with wares and utensils, dining area, living room with cable TV, patio, and own carport. 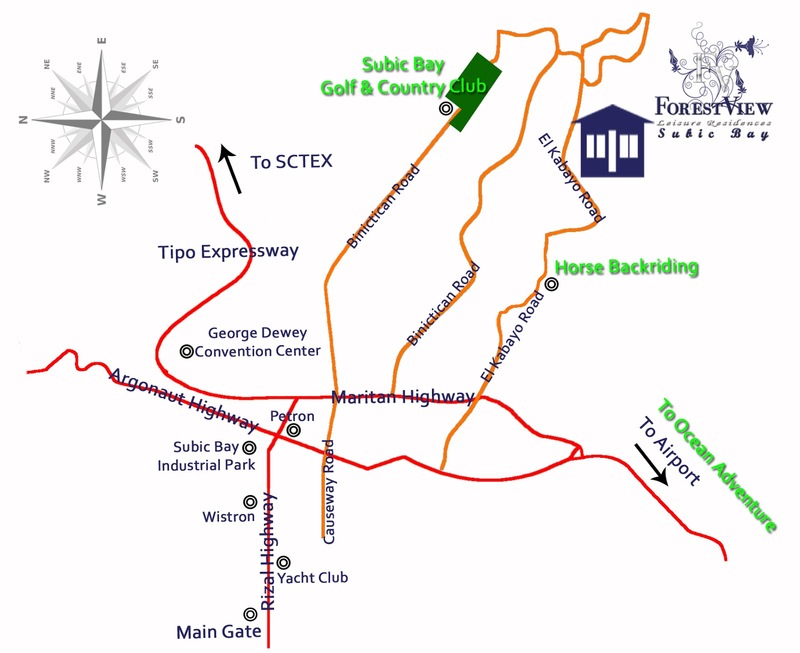 Forest View Leisure Residences is 10-15 minutes away from Zoobic Safari and can easily be found via the SCTEX. Pero kami ay nanalig sa powers ng Google Maps hehe... It is a secluded area and their residential villas can also be rented in a daily, weekly, or monthly basis. The villas are perfect for families with 6-7 members with an average budget. I wasn't able to take a photo of the pool but it's only an adult pool. Buti na lang may salbabida kami and a life vest but the kids were so afraid we had to carry them. Siguro we stayed at the pool for 30 minutes only. Ang tapang ng chlorine e.
In a scale of 1 to 10 where 10 is best, I give Forest View Leisure Residences a 7. And the most important thing is that we all enjoyed.